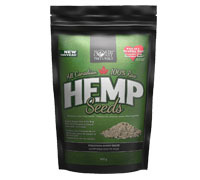 Raw Hemp Seeds are a delicious, raw food snack. No shells — just the "heart" of the hemp seed. A good source of protein, fibre, omega-3 & 6 EFAs, vitamin E and energy. Raw Hemp Seeds add a nutty flavour to foods and can be eaten raw, blended into drinks, sprinkled on salads, ice cream, yogurt, cereal or cooked and baked into items such as oatmeal, breads, casseroles, etc — without losing their nutritional value.